Perennial from a felty-hairy, blackish, tuber-bearing rhizome. Sterile stems 15-150 cm tall, 5-20 mm thick, their central cavity more than 2/3 the stem diameter, regularly and abundantly branched, the sheaths with 15-30 teeth, the teeth with dark tips; branches in regular whorls; fertile stems appearing in spring before sterile stems, 10-40 cm tall, pale brown, unbranched, dying when the spores are shed, the sheaths 4-8, pale brown with 20-40 darker teeth. 4-8 cm long, hollow, rounded at the tip. Moist to wet alluvial forests, loamy banks, cliffs, seepage areas, gullies, swamps, and roadsides, in the lowland and montane zones; frequent in coastal BC, rare east of the Coast-Cascade Mountains; S to CA. 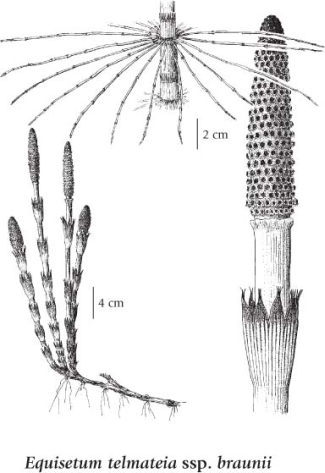 A shade-tolerant/intolerant, submontane to montane, European and Western North American horsetail (mainly in the Pacific region, less in the Cordilleran region, marginal in the Central region). Occurs in maritime to submaritime cool mesothermal climates on fresh to very moist, nitrogen-rich soils (Moder or Mull humus forms). Inhabits exposed mineral soil in broad-leaved stands on water-receiving (floodplain, seepage, and stream-edge) sites with fast-flowing groundwater near the ground surface. Its occurrence decreases with increasing latitude, elevation, and continentality. A nitrophytic species characteristic of alluvial floodplain forests.